Lab Coats And Jackets Provide A Multi-Purpose Outer Layer for Medical, Laboratory and other Healthcare Environments to Protect Personal Clothing. Tailored of sturdy, wrinkle-resistant fabric for long life, lab coats and jackets are made with soft, breathable machine washable 65% polyester combed cotton poplin for exceptional comfort. Other materials include flame-resistant cotton, Microforce Barrier SMS Fabric, Kevlar, and Nomex combos. Available lab coat styles include Unisex, Unisex Microstatic ESD, A40 Liquid and Particle Protection, A20 Breathable Particle Protection, Concealed Front FR Cotton or Nomex, Men's and Women's styles, and more. Available in men's, women's and unisex styles. Sizes range from S-6XL and 6 to 60. Available closure types include Button Front, Concealed Snap Front, Gripper Front, Knot Button Front, Placket Snap Front and Snap Front. Coat lengths range from 16" - 45-1/2". Adjustable wrist areas and side slits provide pocket access. Available colors are Blue, Light Blue, Light Gray, Navy, Royal Blue, and White. 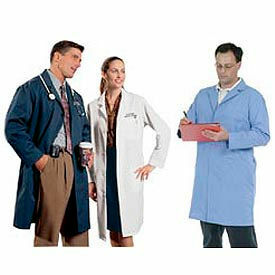 Disposable Lab Coats, Jackets And Gowns Offer Comfort And Convenience For Healthcare Professionals. 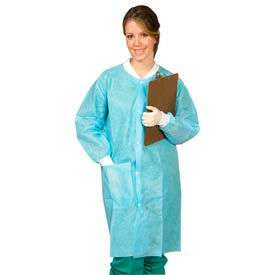 Disposable Lab Coats, Jackets And Gowns are made for long lasting durability and dependability. Fluid-resistant, non-flammable material provides protection and comfort. Meet OSHA requirements for bloodborne pathogens. Lab Coats and gowns available in several closure types including Rear Tie, Snap Front, Velcro Front and Waist Tie. Available with 1, 2, 3 or 0 pockets. Wrist types are Elastic, Knit Wrists or Open. Sizes range from S-5XL, One Size and Universal One. Available colors include Blue, Ciel Blue, Purple, Pink, Sky Blue, White and Yellow. Available in case quantities ranging from 5-100. ESD/Anti-Static Jackets And Coats Create A Path For Static Charges To Travel And Diffuse For Use Around Sensitive Electronic Equipment. ESD/Anti-Static Jackets And Coats feature gripper closures on the front for secure, all-day coverage and safety. Clothing includes left breast pocket and two lower pockets to store supplies, tools, or other essential equipment. Coats are constructed with texturized polyester and carbon suffused nylon for long lasting durability. 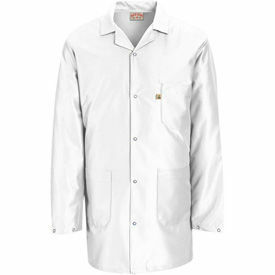 Styles include 3/4 Length Collared Jacket, Static Control Collared Jacket in full length and V-neck, Waist Length Lab Coat, Counter Jacket and Anti-Static Tech Coat. Sizes range from XS to 5XL. Colors are Electronic Blue, Black and White. 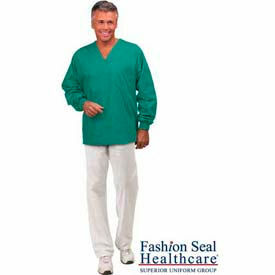 Scrub Shirts Are Used For Hospitals, Medical Offices And Other Healthcare Facilities. Scrub Shirts are made of cotton and polyester for long lasting durability and comfort. Available in a variety of types and styles to suit job requirements and preferences. Styles offer pockets or no pockets, long or short sleeves, and reversible or non-reversible design. Color-coded neck binding denotes size. Styles are Unisex Long Set-In Sleeve Scrub Shirt, Unisex Non-Reversible Scrub Shirt, Unisex Reversible Set-in Sleeve Scrub Shirt and Unisex Set-In Sleeve Scrub Shirt. Colors are Blueberry, Ciel Blue, Cranberry, Jade, Misty, Navy, Teal and White. Sizes are XS, S, M, L, XL, 2XL, 3XL, 4XL and 5XL. 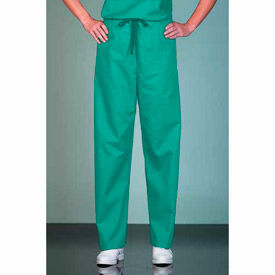 Unisex Scrub Pants Are Used For Healthcare Facilities, Hospitals, Medical Offices And More. Unisex Scrub Pants are made of durable Cotton/Polyester Blend for long lasting comfort and dependability. Have drawcord closure with Easy Glide coordinating webbing. Styles are Non-Reversible with right hip pocket and Reversible with right hip pocket on both sides. Available colors are Blueberry, Cranberry, Ciel Blue, Jade, Teal, Navy, White and Misty. Sizes are XS, S, M, L, XL, 2XL, 3XL, 4XL and 5XL.